That's about how much time I figure I need in a day to get everything done that I want to get done. I have no idea how I am going to fit marathon training into my schedule (much less the other, more ambitious things I am contemplating training for...) when it feels like I barely have time to breath as it is. Am I just being over ambitious thinking I should be able to do all this stuff ("all this" being work full time, single parent full time, take care of a house and yard, 3 dogs, 80 loads of laundry a week, feed my kids something other than fast food or sandwiches once in awhile, and fit in running)? How do you all manage? Clearly, it was very ambitious of me to think I could blog daily for 30 days. Between you and me, I don't even have time for a daily shower! (Remember...single mom, 3 kids, please don't judge!) But that's ok, I do not consider it a fail, because (a) it did make me more aware of what I was eating, and I am now back to tracking everything on my super slow and antiquated iPhone 3G in my fantastic Lose It! app (soon I will be tracking it on my fabulous new iPhone 4s) and (b) I'm pretty sure it was incredibly boring for my reader (hi, Peggy!) to read what I was stuffing my face with every. single. day. 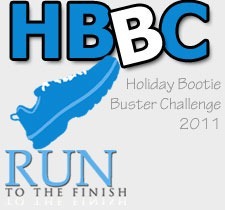 Lest you worry that I don't have anything to challenge me, I will be attempting Amanda's Holiday Bootie Buster Challenge 2011. You may notice that there is a brand new page up top so titled. This was actually a draft, originally called Holiday Bootie Buster Challenge 2010, that has sat on blogger for a year waiting to be published and updated. Yeah, that never happened. HBBC 2010 - epic fail. That is not the plan for this year. Wanna be challenge buddies? Head on over, check it out, sign up, and leave me a comment, and we can motivate the crap out of each other! Now, before I wrap this up and go eat lunch (I feel like I could graze all day today, what's up with that? ), I have a question...I was so excited to start training for my half, thinking that I would start dropping weight again like I did when I first started running. But that hasn't happened - in fact, after losing maybe 5-6 pounds, I have been religiously losing and gaining the same 2 effing pounds for the last month or more. WTF? Explanations? Suggestions? Help, please! 13.1 - Done & Done! Today was "race simulation" day with my half training group, and the longest run we will do before my race on November 13. Originally, I hadn't planned on running the entire 13.1 miles - I had wanted the first time I ran that distance to be on race day. 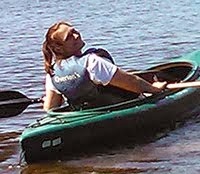 When I got there, though, I decided I would do the whole thing and see what my time was. Since we are doing intervals, I am hoping to finish the race in under 3 hours. The "official" group run was the hilly route we've taken the past few weekends, but the OBX Half is very flat, so a small group of us decided to skip the hills today and run on the nice, flat, shady Tobacco Trail. It was a perfect day for running. The morning was fall crisp, no humidity. The sun streamed through the trees in patches, dappling the ground and giving the fallen leaves a shimmer of gold. The plan was to run a 5 mile out and back in one direction and then a 1.5 mile out and back in the other direction. I ran with a new friend, Megan, and we ran well together. We chatted about this and that, getting to know each other. It still amazes me that I can run and talk at the same time! Given my crappy run on Friday, I wasn't sure how this run was going to go. My calves have been feeling tight lately. I wasn't nervous about the run itself, just that my legs would hurt too much to finish. The first two miles seemed to take a long time, but after that I felt warmed up and ready to go. We passed the honey stand - a little table with local honey and a jar for money, which of course I never have out on a run on the trail. I'm going to have to find my way back there in the car to get some honey! On Wednesday night's run I decided to try Gu for the first time - Espresso Love. It was tasty, worked great and no tummy issues, so today I carried three different flavors: Espresso Love, Peppermint, and Chocolate Mint. At 45 minutes, I randomly picked Espresso Love out of my pack - yum! The effect seems immediate - is it? Or is it mental? Either way, I was feeling good! The last few miles of the out and back were familiar territory - the part of the trail I usually run. We caught up with a few other ladies from our group taking a break at the water cooler and ran with them for awhile, but they are faster and left us behind before too long. I took another Gu at 1:30 (Chocolate Mint) and again, it helped pick me up. By about mile 9 or 9.5, though, I felt like I was flagging. I took my last Gu (Peppermint - no caffeine - could have used the caffeine!). At mile 10, back at the parking lot, we stopped for a few minutes to stretch and so Megan could put her dead phone in her car. The last 3.1 was tough. We were definitely struggling a little and running slower, but I managed a little kick for the last .1!!! Then I was done! I did it! I freaking ran 13.1 miles. I'm kinda feeling like I rock right now! My challenge is not going so great. In my defense, I have definitely been fighting something this week. Yesterday I had an earache all day. I still decided to go for a run when I got home from work - I "only" had three miles on the schedule and I figured how bad could it be? Well, bad. First, it was too late when I headed out to the trail - I should have stayed in the neighborhood but I wasn't up for the hills. Second, I took the Big Red Dog - he loves to run with me, and I haven't taken him in awhile. Third, I forgot to put on my compression socks. All this adds up to one crappy run. I decided to do a two mile out and back, since it was getting dark pretty quickly. Had I not had the Big Red Dog, I would have turned around and gone home (maybe I should have anyway!). I ran the first mile out, trying to rein in the dog, who was hot to trot. Actually, I ran for 10 minutes and then walked for two minutes. Turned around at the one mile post and started running again. I maybe made it half a mile - I don't even remember. My shins hurt. My heart wasn't in it. I was struggling. I decided it was stupid to push myself and end up hurt, so the Big Red Dog and I had a nice (but quick) walk back to the car. I am so glad I had him with me, because it was pretty dark by the time I got to the parking lot. Dumb, dumb, dumb. It made me realize that I am going to have to get more creative here very shortly with my weekday runs, as the days get shorter. Tonight's run was with my running group. 6 miles. I only finished because I wasn't running alone - sadly, I think I would have given up. I was rushed to get there. I scarfed two pieces of pizza before I left. I couldn't find my compression socks. I ran with a faster group doing 4/2 intervals instead of my usual 3/2. It was hilly. I am definitely fighting something. I fell asleep at 9:00 last night and was still so tired at work I had to lay down on the floor for 40 minutes. I'm proud of myself for sticking it out and getting it done. As for recording what I'm eating - I am feeling very blocked about it. I have been writing it down but not getting it into my Lose It! app so I can see exactly how many calories I'm eating. Why is it so hard all of a sudden? I know why - because I'm not losing. Last year at this time I was dropping pounds like crazy, and now I seem to keep gaining and losing the same 2 pounds and I am frustrated! Time to snap out of it. I need to figure out a plan I can stick to. I feel so inconsistent - sometimes I am like a pit bull with a bone when it comes to sticking with something, and sometimes I can't follow through to save my life. I need more consistency. A better plan. I will work on this. In my spare time, LOL. I think I am definitely fighting something. I'm feeling run down and tired. My goal this week is to be in bed by 11:00 every night - I think ideally I would like to aim for 10:30, but first I need a TiVo! Since it's already almost 10:30, I am going to make this quick! Maybe tomorrow I will be up for writing about my super 12 mile run, assuming I haven't forgotten all about it by then! Hmmm...I didn't eat very well today. Maybe that's why I'm tired and achy? Hopefully sleep will help and tomorrow will be a better day - I sure hope so since tomorrow is a running day! I sort of skipped yesterday (two fails in less than a week - oops!). I have excuses, though. I took the kids to the awesomely awesome Kings Dominion to meet my awesomely awesome sister and her family. My plan was to be there when the park opened at 10:30 (meaning we had to leave at 7:00 am) and then get on the road to head back no later than 4:00, since I had a 12 mile run today. Well, you know how it goes. We were with family. We were having fun. 4:00 stretched to 5:00, and then to 6:00 before we were finally headed toward the park exit and the mandatory souvenir shop stop. It was around 9:30 by the time we got home - I had been up since 5:30. Long day. I skipped the blog and crashed. Actually, I skipped the blog, read in bed for awhile, and then crashed! All was well until around 1:00 in the morning, when I woke up and felt...not quite right. I proceeded to spend most of the next hour in the bathroom feeling not quite right, worrying about how I was going to run 12 miles in the morning. Was I sick? Did I eat something? I guess I will never know - after a miserable hour I was able to fall back asleep and felt fine when I woke up for my run. I will save the details of the run for tomorrow when I have a little more energy (maybe I am getting sick? or maybe 12 miles just beat the crap out of me? ), but I will list what I ate yesterday and today, or what I can remember, anyway! That's as much as I can remember. I started this post at 8pm on Sunday night, and now it's almost 9pm on Monday and just finishing it...I, um, kind of fell asleep in the middle of typing it last night. Do long runs make anyone else this tired? Am I just fighting something? J isn't feeling well, either, so maybe we caught a bug. Maybe I need to do something differently before, during or after a long run? Suggestions welcome!! !